On Friday I went to the spot on the picture. It was actually a lot of fun and a lot of exercise. 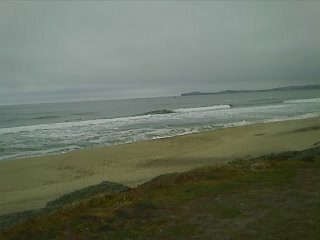 I do not usually like to surf here because there usually is a lot of paddle out required, and Friday was no exception. Most of the times, I just get washed right back to the shore even if I am paddling 5 minutes continuously... It is really amazing that how strong surfers can just plow right through the stuff! But over the years, I have learned a lesson. I just wait in the middle of the water and let the side current take me to the rip. The it happens is that there are islets of sand bars out there and between these islets there are channels. It is just amazing that almost no effort I can taken away from the shore and the calm outside. I used be very scared about that too, but again, I now have enough confidence and skill to come back so now it is a lot easier and fun way to get to the outside. I had to share the with some of the best local surf competitors and a surf shop owner in town, and that usually means that the spot was the only game in town. It is always good to get out with these folks because they just demonstrate to you how these waves are to be surfed. It still shows that I have a long way to go, and I probably don't have much chance in getting as good as they are as I have really started surfing late in my life. That does not mean I won't try. I will keep trying, and I did make progress too. Another real fun surf day on Saturday. Though the waves were smaller, I caught several fun long rides on my Walden Magic. Long boarding is really fun and especially now I am walking on the board that is a lot more challenging move practice I can try. The beach cleanup was a big success with a lot of StokeMaster friends showing up. Hope that we will do more of this session again. On both days, I am still painfully reminded me of the speed. In order to get surf like experts, I need to move more radically on the board to positively produce more power. If there is more power then I have more option to position myself on the wave to extract more power. Executing a cutback is a good example of this. If there is good speed going and I see that the losing the power ahead then I can cut over back to where I came from. I can wait for the wave to build then continue, or simply do a pull out maneuver. Being not so athletic in nature, I tend to be timid and don't work too hard with the board. Even if I catch a good wave, I just waste most of that just standing on it, or crouched down all the way down. You will see me working on this this season.